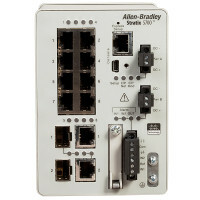 Bulletin 1783 Stratix 5700 Managed Industrial Ethernet Switches use the current Cisco Catalyst switch architecture and feature set. They are designed to meet your switching capability needs, from smaller applications to IT-ready integration with plantwide infrastructure. Configuration and monitoring tools provide secure integration to the enterprise network and allow easy setup and diagnostics from Rockwell Automation® Integrated Architecture. Studio 5000 Add-on Profiles (AOPs) enable premier integration into our Integrated Architecture system.